The SQL Server plan cache can be a good tool to use in identifying current performance issues and in looking for new ways to improve performance. When you fix these plans, and often the fix is quite simple, you can improve overall performance. You can examine the plans currently inside your plan cache and look for ones that have missing index hints (Figure-1 is an example from SolarWinds Database Performance Analyzer). Figure 1. Using SolarWinds Database Performance Analyzer to examine plans inside plan cache. Be careful, though. Adding indexes can negatively impact any deletes, updates, and inserts. Test thoroughly to make certain that adding an index won’t create new problems. Plans with implicit conversion warnings likely indicate a mismatch in the datatype used in the query with the datatype defined in the database. A very common example of this type of mismatch is use of an integer value in the query for a column defined as VARCHAR or NVARCHAR. From experience, I recommend trying to change the code before changing the column datatype. You can also examine the plan cache to find plans with clustered index seeks and key lookups, which are good targets for tuning. For example, use the following code to return a row for every operator inside of every plan in the cache. If you don’t want all the operators, you can modify this code to filter as needed. It might take a few minutes to run this on a large plan cache. I often focus just on key lookups at this stage, because they can be easily fixed by adjusting indexes. 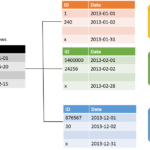 See Jonathan Kehayias’ excellent example of this at: http://www.sqlskills.com/blogs/jonathan/finding-key-lookups-inside-the-plan-cache/. Be sure to read this full article for more information about how you can improve SQL Server performance by minimizing single-use plans (Part 1) and minimizing queries that are logically equivalent (Part 3).